Server Message Block (SMB) is the core file-transfer protocol of Windows, MacOS and Samba, and has become widely deployed. It’s ubiquitous - a 30-year-old family of network code. However, the latest iteration of SMB3 is almost unrecognizable when compared to versions only a few years old. Extensive reengineering has led to advanced capabilities that include multichannel, transparent failover, scale out, and encryption. SMB Direct makes use of RDMA networking, creates block transport system and provides reliable transport to zetabytes of unstructured data, worldwide. 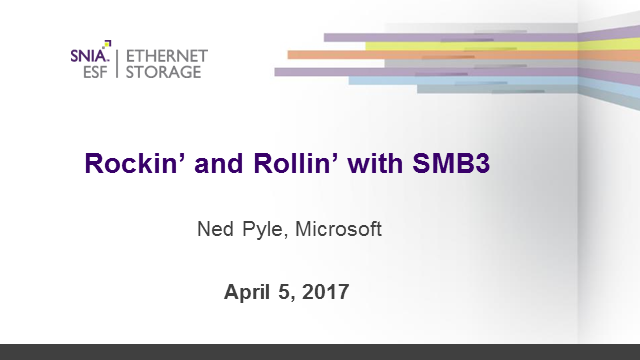 SMB3 forms the basis of hyper-converged and scale-out systems for virtualization and SQL Server. It is available for a variety of hardware devices, from printers, network-attached storage appliances, to Storage Area Networks (SANs). It is often the most prevalent protocol on a network, with high-performance data transfers as well as efficient end-user access over wide-area connections.